SDCC 2018: Did Warner Bros. finally turn a corner with DC films? 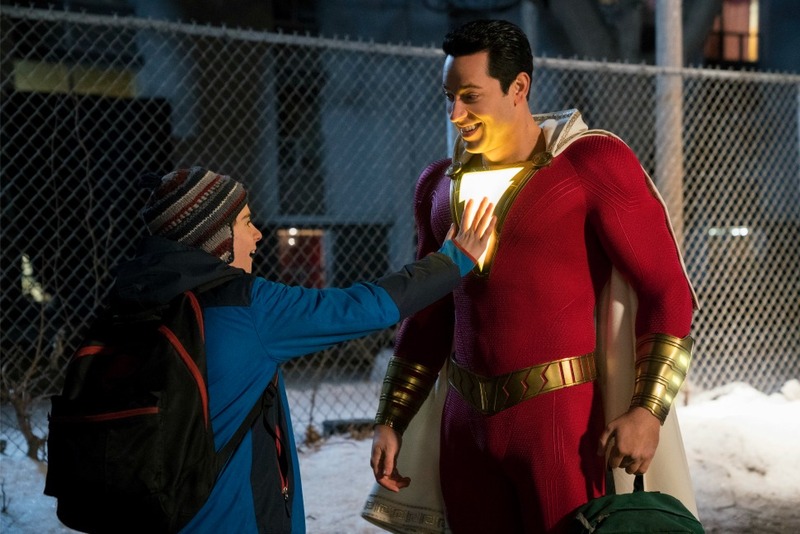 (L-r) JACK DYLAN GRAZER as Freddy Freeman and ZACHARY LEVI as Shazam in New Line Cinema's action adventure "SHAZAM!," a Warner Bros. Pictures release. Warner Bros. needed an unqualified win at SDCC this past weekend. Did they get one with the “Aquaman” and “Shazam!” trailers? It certainly appears they did. It was all about Warner Bros. and DC-Comics based movies when it came to big announcements and trailers coming out of San Diego Comic Con last weekend. Admittedly, they needed to make a splash. Yes, “Wonder Woman” was an unqualified success for them last year. However, the middling success of “Justice League” led some of the non DC-faithful to wonder about the studio’s commitment to the DC Extended Universe on film. The subsequent news that the studio was exploring making films about DC characters that would be outside of the DCEU added more uncertainty. Allowing flexibility for creators, or muddying the brand? Just depends on who you ask in terms of the answer to that question. Regardless, with Marvel Studios eschewing a Hall H presentation at SDCC this year, the door seemed open for Warner Bros. to earn an unqualified marketing win. They certainly seemed to make the most of the opportunity. The SDCC trailer we got show the film promises an origin story for Atlantis’s Once and Future King. It seems we’ll also get some royal family in-fighting and lots and lots of Atlanteans of all shapes and sizes. In all fairness, this IS a lot that’s “nice” about what we get here. Patrick Wilson always plays a great baddie, and Nicole Kidman brings every bit of regal gravitas and luminosity that audiences have expected since her casting announcement in those quick cuts showing her as Atlanna. Plus the action looks epic, the effects are impressive, and Mamoa brings more of the same brooding swagger here that he did in “Justice League.” All good things. But admit it — it all looks pretty conventional, doesn’t it? That’s about as different as it gets in terms of tone and execution. The tie to the DCEU is clear, but not overstated. The humor and heart are completely at the forefront, as opposed to the special effects. Perhaps most importantly, it seems to nail the spirit of “the character formerly known as ‘Captain Marvel. '” It appears that receiving the powers of the Wizard Shazam will be the beginning of an emotional journey for young Billy Batson — back to trust, back to hope, back to living. Along the way, he’ll learn how to a be hero, with some help from Freddy. Elvis would be proud. Which trailer was better? I’ll leave that to others to debate. What I think is a lot more clear is that between these two trailers we now know a lot more about what the post-Snyder DCEU will look like. While “Aquaman” retains some of the heaviness of the earlier films, “Shazam!” lights up a much different path, one that at least from the trailer looks like a lot of fun. Now, yes, of course, trailers are made to look like fun to their target audiences. It’s very early — “Aquaman” is still months away and we won’t get “Shazam!” until next Spring. But if this trend, where the filmmakers’ focus is more on character, heart, and humor, continues, then the future is certainly brighter than it was just a few years ago after “Batman v. Superman.” “Wonder Woman” proved they could get the balance right. Now they just have to show they can be consistent. This weekend’s net effect, at least for this longtime DC Comics fan who’s been waiting way too long for WB to finally get it right, is elation. How about you? Did you come away from SDCC this year feeling hopeful about the future of DC superheroes in movies? Spider-Man: Far From Home 1st Trailer! “Titans” trailer debuts … wait, what did you say, Robin?